Pat, KE4IKC, and Jan, KF4TMO, are both General Class Amateur Radio Operators. 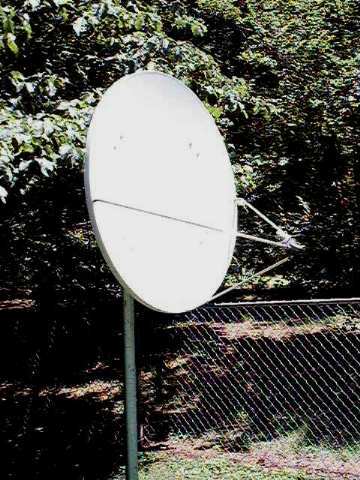 As such, we are interested in all kinds of radio related things, such as Satellite TV. This is the one picture we got on New Year's Eve, 1999, waiting for all hell to break loose (which, of course, it didn't). Here is Pat about to fall asleep in the Gwinnett County Police Headquarters building briefing room, which is where they had us set up. We spent the night with Gwinnett's Finest, including the SWAT team! The other two folks in this picture are bored hams, also! However, a couple of weeks later, something DID happen! 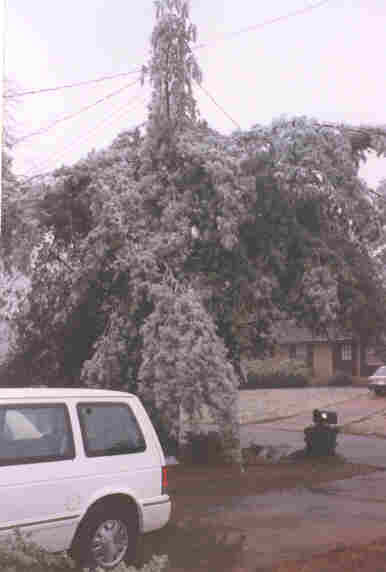 In the middle of this ice storm, the County's trunked 800 MHz Radio System went down. So we were called out again. Ordinarily we refuse to drive in conditions like this, but as it turned out almost all of the ice was in the trees... the roads were pretty clear. So we trudged over to Police HQ. By the time we got there, they had the system back up, but they kept us around for a while just to be sure. Which was OK with us... we lost power about the time they called, and Police HQ was nice and warm! 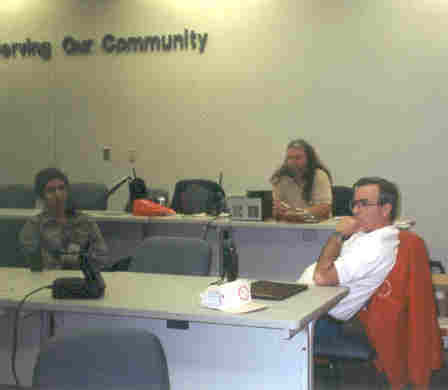 We were very active in Amateur Radio Emergency Services (ARES) in Gwinnett County, until the Y2K panic completely burned us out. One of these days we will probably get back into ARES, but for now we are not doing too much of anything radio related other than keeping in touch with each other and a few friends. We wanted to mention it though, because it is a good hobby that needs new blood. More info to follow, in the meantime check out the ARRL web page. One of these days, this will be part of our EMWIN (Emergency Managers' Weather Information Network) receiver. For now, it's a nice bird perch. This picture was taken with the D-Link digital camera.